The Chozen-ji tradition of training follows principles known in Japanese as “Zen, Ken, Sho”. Zen refers to zazen, which, as I have explained in an earlier post, is seated meditation. This is probably what comes to mind when most people think of Zen training. “Ken” is the Japanese word for sword, as in “kendo” (“the Way of the Sword”). In this context, it refers generically to the martial arts. Martial arts taught in the Chozen-ji system include kendo, a two-person sword form known as the Hojo, iaido, karate, aikido, judo, tai chi, and kyudo (archery). “Sho” means “calligraphy”, and refers broadly to the fine arts. In addition to calligraphy, kado (flower arrangement), shakuhachi (bamboo flute), and ceramics are practiced in the Chozen-ji system. Typically, a student will practice at least one martial art and one fine art in addition to practicing zazen. The principles of breathing, posture and concentration remain consistent throughout zazen, the martial and fine arts. Zazen is perhaps the best way to experience and deepen samadhi, which, as I have explained in an earlier post, is a state of relaxed concentration. Samadhi itself, is fostered by hara breathing. But it is one thing to maintain samadhi in a quiet meditation hall; maintaining it in the rough and tumble of daily life is quite another. Training in both the martial and fine arts allow one to extend the principles of zazen—and, hence, samadhi—to dynamic activity. So, in the Chozen-ji tradition, hara breathing is emphasized in all of our training activities and we have developed schools of martial and fine arts that reflect this. From that perspective, flower arrangement and judo can both be seen as ways of developing hara. Because of their intense physicality, martial arts excel as ways of increasing the power and intensity of hara, while the fine arts may be more helpful in refining the breath and developing sensitivity. However, these two aspects of hara training complement each other well; martial arts are Yang to fine art’s Yin. I have already posted one video of an example the role of hara in a fine art: shakuhachi. In this post, I have examples from two martial arts as they are practiced in the Chozen-ji tradition: Tai chi and kyudo. The Chozen-ji school of Tai Chi is called Mu-I Tai Chi. “Mu-I” means, in Japanese, “no fear”. It refers to the Zen belief that the greatest gift one can give is the absence of fear. Mu-I Tai Chi was developed by the late Dogi Kow Roshi; it emphasizes hara breathing to a much greater extent than many forms of Tai Chi. 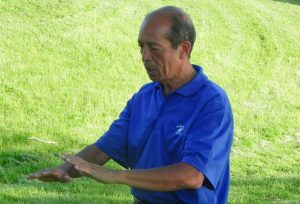 In the video, Alex Greene demonstrates 2 of the 12 moves of Mu-I Tai Chi and how the hara is engaged in executing them. Kyudo is the traditional Japanese art of archery. Many Westerners were introduced to it in Eugen Herrigel’s Zen and the Art of Archery. In kyudo, the process of shooting an arrow is broken down into 8 stages, referred to collectively in Japanese as “Hassetsu”. While I use kyudo terminology in the narration, you don’t need to pay attention to it unless you are a kyudo practioner. In the video, Adrienne Hampton uses what is called a gomu yumi (rubber bow) as a substitute for a real bow and arrow. However, the breathing patterns are the same regardless which type of bow is used. In watching both videos, concentrate on how the movement of the meter throughout the sequences of motion. You will see that maintain expansion of their lower abdomens throughout and but that the expansion increases when more power is needed. Further, in spite of the increase in expansion in their lower abdomens, the rest of their bodies remain relaxed. I would like to take this opportunity to call your attention to two courses related to this blog. The first is an upcoming hara development workshop, called HaraZen, that Alex Greene and I will be conducting through the Institute of Zen Leadership at the Spring Green, Wisconsin Dojo in March 2017. The second is Gordon Greene Roshi’s Udemy course entitled The Manual Labor of Zen Meditation. I recommend you check it out if you haven’t already.